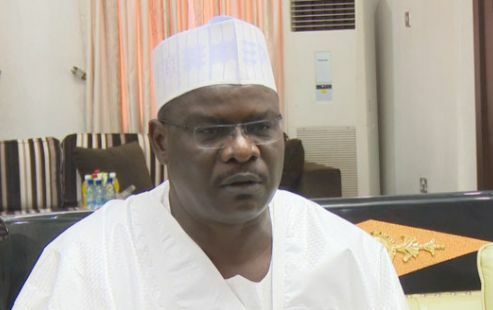 Speaking while addressing journalists at the National Assembly after his resumption on Wednesday, former Senate Majority Leader, Ali Ndume, opened up on why he headed to court to seek judicial ruling on his suspension. He said his action was beyond a personal struggle but a fight for democracy. Recall that the Senate had on March 30, suspended Ndume for calling for an investigation into some allegations of impropriety against Senate President, Bukola Saraki and Senator Dino Melaye. However in September, when the six months had passed, the Senate issued a statement extending the suspension to November, on the excuse of discounting holidays and weekends. But a Federal High Court nullified the suspension, saying it was illegal. The court ordered Ndume’s immediate reinstatement and payment of all his entitlements for the period of the suspension. Ndume said; “I really do not want you to feel that I’m taking this on anybody. No. This is a democracy and there are structures on ground to test our nascent democracy. “I didn’t go to court for my personal reason. I went to court to find out if what was done to me was right or wrong. The court decided that what was done to me was wrong but the Senate says it would appeal the judgment. Ndume in his usual white traditional ‘agbada’ and cap, thanked Nigerians for the support shown him during the time of the suspension, and also expressed grief on the death of a senator, Isiaka Adeleke, who he described as his ‘landlord, and Yelwa, wife of a senator, Danjuma Goje. “I want to use this opportunity to thank everybody and God. For over seven months, I was not here. Within this period a colleague of mine who sat right behind me died. Another colleague and friend of mine lost his wife. Also, two of my colleagues lost their seats. “In the House of Representatives, two to three people died and one lost his seat. It could have been me because I am not better than any of them. So, I thank God.